NORTH, SOUTH, WEST, EAST, Spain, Route ideas and places to go. Moonlight Sonata Mountain Rescue organise a night challenge. MountainViews will be organising Walkers Winter Talks starting in 2017. L to R: Erik the Red Lands Trek, Greenland; Kungsleden Trail, Sweden; Torres del Paine, Patagonia, Chile. Note: Laponia is the arctic region of northern Sweden; Patagonia is in Argentina and Chile; Greenland is in, well, Greenland. Two of Paul Clement's books. Friday 17th Feb 2017. 7:30 for 8pm. MountainViews Gathering and Awards. 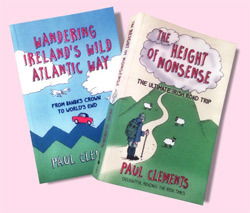 Paul Clements, author of by far the funniest book on the Irish County Highpoints will be speaking on the Wild Atlantic Way. Gareth McCormack will be talking about Mountain Photography. Read the review of his book in this newsletter to see the quality of his work. Other items are being finalised but will include the annual Awards ceremony for people receiving commemorative certificates for complieting Irish summit lists. There is a fee of Euro 8 for this event. Come early to see books on display and to avoid a delay at the entrance. Tuesday, 11th April, 2017. 8pm. Hillwalkers' Geology in Ireland. Speaker: Patrick Roycroft, President of the Irish Geological Association 2015. 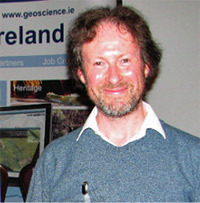 Patrick has written one of the most enthusiastic and popular books on Irish Geology. Where else will you find a fossil, rock, mineral and gemstone for every county in Ireland? Or an account of every meteorite ever recorded here? These meetings are being organised by the MountainViews committee with assistance from the WAI. Talks are held in the Landsdowne Hotel, 27 - 29 Pembroke Road, Dublin 4 unless otherwise stated. Entry is free unless otherwise stated. There is a collection. Directions here www.lansdownehotel.ie . The excellent bar facilities allow you to have a drink with other hillwalkers after the event. You can get a meal before the meeting also. Should you wish to stay overnight then please consider staying with the Lansdowne. 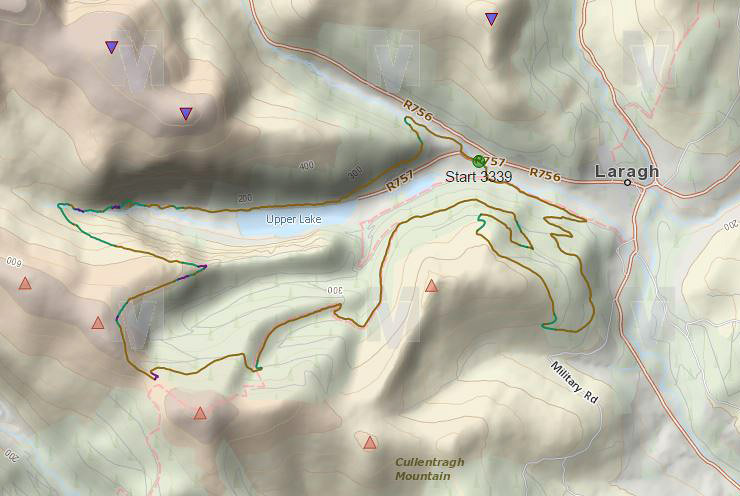 December's track of the month comes courtesy of Trailtrekker, and is a digital rendering of this year's Glen of Imaal MRT Moonlight Challenge. Participants were set off at around 4pm on a November afternoon and spent the next five hours or so gallivanting around the periphery of Glendalough (which sounds like great fun) and were rewarded with a lovely evening that (as the photo shows) couldn't be sued under the Trades Descriptions Act. 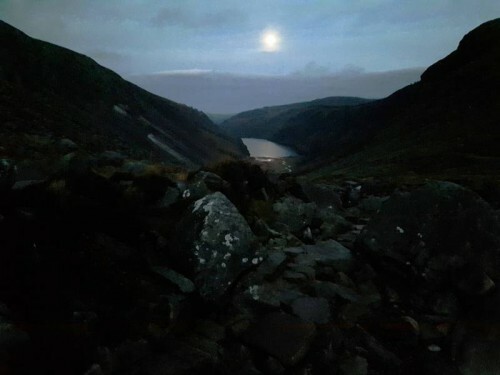 The Annual Glen of Imaal MRT Moonlight Challenge is always one of the best organised challenge walks on the calendar in my experience. This year's route started and ended in Glendalough going around the edges of the Glen. This route does not take in any MV summits, but comes close to three. 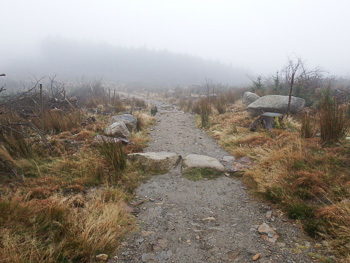 Most of the ascent is done by the time you pass Lugduff SE Top and much of the route is on forestry tracks, boardwalks and well established routes. One of the benefits of doing this as a Moonlight Walk is that you avoid the madding crowds that throng the lower reaches of this area on your average weekend! The only downside can be traffic congestion caused by slower walkers on the boardwalk sections! While there was great disappointment for those looking for a supermoon over the last couple of nights, there was no such disappointement on Saturday night, when this Challenge was indeed a Moonlight one! Tormore Island North is a towering sea stack off the Donegal Coast, the highest such in Ireland, says IainMiller, who also supplies a spectacular video showing his ascent. Knockchree huddles shyly at the foot of the southern edge of the Mournes, providing plenty of opportunity for quiet contemplation of both the sea and the mountains to the north. David-Guenot has filled a little gap in his holiday schedule with a quick ascent on the way to the airport. His track illustrates the usually taken route to the top, an easy ramble of less than an hour. Hen Mountain’s autumn plumage contrasts brightly with the green landscape, and its amazing tors make it something of a rare bird, suggests David-Guenot. David-Guenot on Hen Mountain: A little hill with some personality. On her ascent of the beautiful Slieve Binnian, susanc snapped the Mournes in their autumnal finest. Croaghgorm in the Bluestacks requires more than one outing to fully appreciate its beauty, geology and history, reports Aidy. 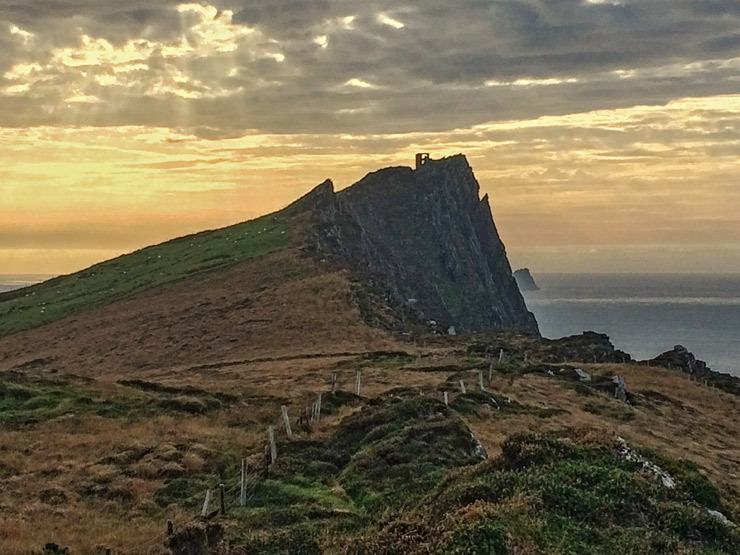 Slievemore on Achill is one of those mountains that keeps on giving, combining history, splendid scenery, sea cliffs, scrambling and a lot more, reports Kennyj. WEST: Reportedly walkers restricted in important carpark in the west. According to a report from our member Jamessheerin, the new owner of Kylemore Abbey is now refusing to allow walkers ascend Doughruagh (and many other hills) from their car park. We hope that common sense prevails since apart from anything else this denies the new owners revenue from sales in their café. If this turns out to be the settled policy into the future then it is regrettable because a number of nearby summits can only easily be reached from this area. Should it be that the policy turns out in future to be different, we will of course update our comment. Here's a picture of the lookout tower on Ceann Sibeal. Taken from the approach from the 3 sisters side. Care needs to be taken on this section as the exposure is significant in parts. Keep this walk for good visibility. Genuinely snowy conditions are generally at somewhat of a premium in the Irish mountains, but GSheehy was on the spot to take full advantage of the recent cold snap to get out and about in the Knockmealdowns. 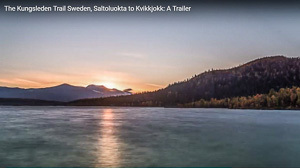 His uploaded track is a comparatively 'obvious' south-facing circuit based on the reigning summit of the range, but in this instance the devil is in the photographs; certainly they made your track reviewer somewhat distraught that he was working that weekend. The diminutive Knockatee is a steeply-sided distinctive hill in the Cahas, and the place where author Richard Mersey began his walking career leading to his fine work on ‘The Hills of Cork and Kerry’, reports Simon3. group on Knockatee, (Cnoc an tSí): Small hill with stories and a massive view. Taking a little time away from his busy schedule of bicycle parkour practise, simon3 has spent some productive time down in deepest darkest Iveragh exploring some unfrequented coastal summits. Amongst these wanderings was the brief ascent of Knockatee, and his track includes some cracking photos taking advantage of some superb atmospherics, while also demonstrating what's possible with thee track uploading system. simon3 on Short walk on Knockatee with great views. One of the many decisions confronting the Kerry hillwalker is exactly where to start and finish the splendid horseshoe circling the head of the Black Valley and culminating in Stumpa Duloigh. Many will open with the substantial starter of Broaghnabinnia, and they may well find themselves flagging later in the day: such folk may wish to avail of Onzy's track for the individual ascent of the final summit in the circuit, Mothaillin. Coming in from the south it's a vegetative tussle, which may incentivise folk to dig a little deeper when doing the circuit from the north! EAST: You’ll have no love for this eyesore. Cupid was the god of love and affection, but Cupidstown Hill, named after him, has been treated with hateful disregard judging by the filth of the place. Wild_brian makes the unpleasant five-minute trek to the top. SPAIN: Pico, Cares River and more .. Annual 2016 - to be published in Feb 2017 - Start thinking about stuff for this now please! In February this year we brought out an Annual, a 46pp PDF style magazine see link below. We hope to do the same next year, "The MountainViews ANNUAL 2016". We are looking for feature length illustrated articles. And photos. And items for "Your Walking Highlights of 2016". For the highlights we are mainly looking for experiences in Ireland though as last time we will include some adventures abroad. Comhairle na Tuaithe (CnaT) is an officially sponsored liaison group in the Republic between various bodies such as government, landowners, and Mountaineering Ireland as the representative body for hillwalkers. Originally pushed forward from 2004 by Éamon Ó Cuiv an FF TD and then minister it has somewhat languished after changes in government. 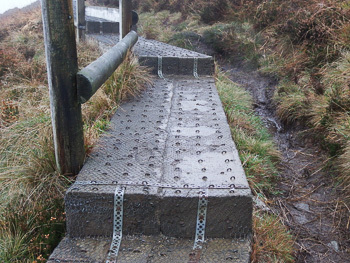 Recently Mountaineering Ireland distributed copies of the "Comhairle na Tuaithe Mountain Access Project" - draft August 2015, which sets out to be "a practical proposition developed to address the furstrations which arise for landowners arising from increasing recreational use of private land, and the desire amongst recreational users and rural tourism interests for cetainty of access". The document makes interesting reading and has a plethora of reasonably constructive points to make most of which I would support though with a few suggestions. It also makes a welcome change from policies that are dominated by conservation, regarding recreation as secondary. As opposed to a management approach which includes targets for diverse recreational activities as well as conservation. At present there are two pilot projects: Benlevy, Binn Shleibhe in the Partry/ Joyce Country mountain area and the MacGillycuddy Reeks. There's a renewed interest by some promoters in various obtrusive developments in the uplands of Ireland. From cable cars to bulldozed roads into quiet valleys to handrails to high mountains. The CnaT's more measured approach sets a much better standard with due consideration to the many ramifications of organising upland access. I would urge those interested to take a look. At this point I would usually give people a link to download the document. I looked for it on CnaT's website https://www.environ.ie/community/rural-development/comhairle-na-tuaithe/ as linked by Google, but found only error messages. Not a good start. And I note the draft was released in Aug 2015 and apparently has not been released as a finished document at the end of 2016. All of which I suppose leads me to wonder to what extent is this project serious? If we get a link to an online version of the document, we will publish it. Near the start of the boardwalk. Near the JB Malone memorial with hole in wood. This is what the alternative can look like. If you are interested in the background to this case now being reheard take a look at this account in three parts presented by member CaptainVertigo. We have included the first part in full here. Links to the second and third are included at the end (at time of publication the result has not been decided so there may be more). If you interested in this case and its implications, particularly if your first reaction is well, hot-under-the-collar do take a look at the the facts as they are emerging. Even if you do not change your opinion it can do no harm to hear both sides of the story. Perhaps also you may reflect as to whether the boardwalk was ever the most appropriate approach and was driven by a vision more tuned to conservation than a balanced management strategy. We have included some photos of the boardwalk in question taken on 27th Nov 2016. Back in April, Teresa Wall, an experienced and accomplished hillwalker, was awarded €40,000 by the Dublin Circuit Court for personal injuries she suffered when she fell on a boardwalk on the Wicklow Way. 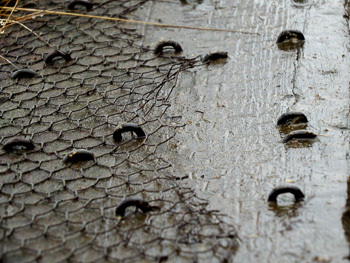 The award was made against the National Parks and Wildlife Service (NPWS) who had constructed the boardwalk. 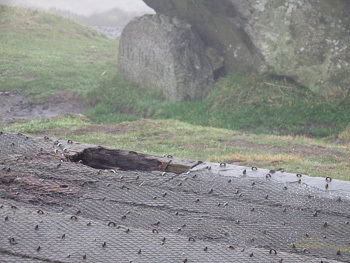 NPWS duly appealed the decision to the High Court. The appeal, which involves a complete rehearing of the case, has commenced before Mr. Justice Michael White in the High Court, and is ongoing. For many years, a key issue for hillwalkers has been the question of free access to the mountains. 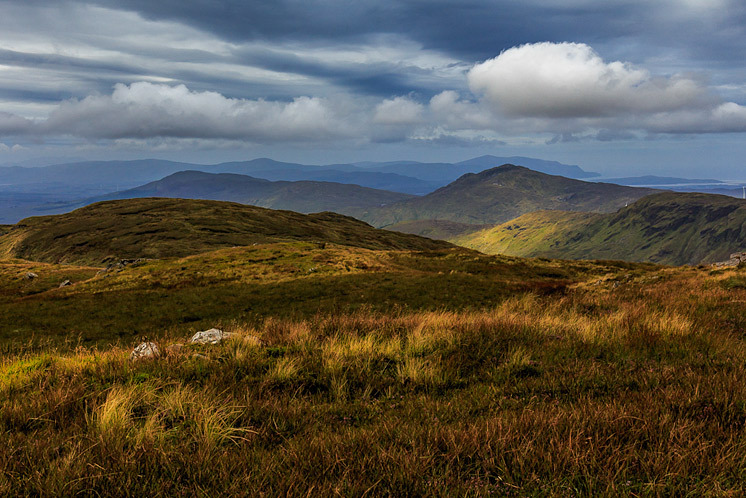 Landowners (strictly speaking “occupiers”), usually farmers, are generally tolerant of hillwalkers but express concern that they may be sued if a hillwalker is injured while on their land. Hillwalkers generally hold themselves bound by the principle that they take on all risks associated with their endeavours and if they get injured they will suffer the loss. Suing, hillwalkers say, would be futile and they point to the powerful protections afforded to land occupiers by Occupiers' Liability Act, 1995 which greatly curtails opportunities for successful litigation by “recreational users”. When the Circuit Court made its award to Ms. Wall, the farming community seized on the decision as proof of its worst fears: here was a hillwalker who not only sued, but won her case! The legal duty of occupiers of land to “recreational users” is set out in Section 4 of the Occupiers' Liability Act of 1995. It is the same low duty that is owed to trespassers: (a) not to injure the person intentionally, and (b) not to act with reckless disregard towards that person. The Supreme Court interpreted this legislation in the case of Geraldine Weir-Rodgers v SF Trust Ltd in 2005. A young lady fell off a cliff in Donegal. She was a recreational walker. She lost her case because the landowner had not injured her intentionally and had not been guilty of reckless disregard for her. The Supreme Court effectively decided that the young lady went walking by a cliff and fell off because she went too close to the edge, and that was nobody's fault but her own. The lady's lawyers argued that there should have been signs erected to warn her of the danger that she might fall over the edge but the Supreme Court said that the lawmakers could never have intended to litter the countryside with warning signs. Such signs would be legally required (in open countryside) only in the most exceptional circumstances. The lower courts must follow the Supreme Court. In my respectful opinion, the Circuit Court judgment in favour of Teresa Wall was not an attempt to overturn these well-established legal principles. In fact the award was based on a very narrow ground, having nothing to do with the open mountain and everything to do with the creation by the NPWS of a “structure” on the mountain which it failed to maintain. Teresa Wall never claimed that there was a problem with the mountain. 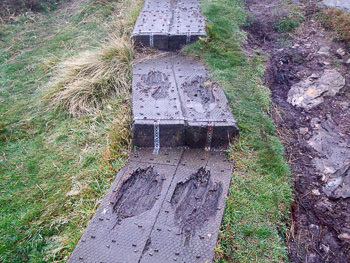 Her claim was that there was a problem with the boardwalk, a structure that was put there primarily for the use of recreational users (hillwalkers). The 1995 Act specifically says that if you put a structure in place primarily for recreational users then you must maintain it. The Circuit Court judge decided on the evidence that the boardwalk had been put there for recreational users and had not been maintained, and Ms. Wall was hurt as a result, and that's why she won. The case most certainly did NOT decide that anyone getting injured on a mountain must be compensated by the occupier. But needless to say that perception has gone abroad. (The Collins Press 2016 ISBN 978-1-84889-289-7 Hardback 240 x 270 mm 224 pages). [Editor's note] Two years ago the author's wife Helen Fairbairn spoke at our Annual Gathering and now Gareth McCormack will be speaking at this even in Feb 2017, details above. They have been generous with their time. Take a look at the review and perhaps you would consider coming to this event and/or buy his excellent book, purchasing options below. The book would make a great seasonal present. Review This book is a collection of very fine photographs taken in the Irish uplands. It is not a collection of route descriptions of walks to the summits of Ireland's mountains - unlike the similarly named book by Paddy Dillon, published by Cicerone. 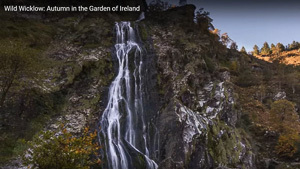 Readers of walking magazines and guide books may already have come across Gareth's work as his photographs have been included in several publications such as Walking World Ireland and in some of the guidebooks published in recent years by the Collins Press. The book is divided into sections based on the four provinces, Ulster, Leinster, Munster and Connaught before closing with a section on People and the Mountains. The book does not cover every mountain range in Ireland so your favourite hill may not be included. Ulster has chapters on Donegal and the Mournes while the section on Leinster only has images from Wicklow. The section on Munster has images taken from the Comeraghs, the Reeks, Beara and the Galtees with Brandon given a chapter of its own while Connaught has chapters on Connemara and Mayo. Most chapters are prefaced with interesting historical and geological information together with reminisces about the times spent taking the photographs. The book also has some technical notes regarding photography and many of the people listed in the acknowledgements for their assistance to Gareth are very well known in hillwalking and mountaineering circles. Photography has been described as "painting with light" and if anyone had any doubts about photography being an art form, such doubts would be quickly erased by the most cursory browse through this book. The author has spent more than 20 years compiling the images in this book. It was time well spent. From Slieve Carr looking south. Given the snow and the remoteness that would be some epic trip! Collecting the images must have demanded considerable physical effort and discomfort, not only in carrying cameras, lenses etc. up and down the mountains, but being out at all hours in difficult weather conditions. It seems it wasn't all hardship though. When I first saw the wonderful photograph of the winter sunset across the snow covered Nephins taken from the summit of Slieve Carr, for example, I assumed that taking the photograph must have involved a winter camp in one of the most remote areas in Ireland. The text, however, described a memorable day stuffed with both effort and enjoyment. Capturing that image involved mountain biking and snowboarding before carefully walking out in the dark after a very satisfying, exhausting but fun-filled day. Everyone who reads this book will have their own favourite photographs. 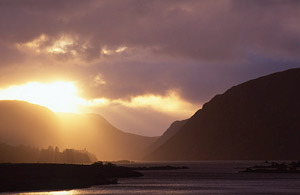 One of mine is an image of Glenveagh National Park which reminds me of a Turner painting. Some of the panoramic views reproduced in this book are really beautiful and, for me, the photograph of Killarney's Upper lake is particularly impressive. This is a book that you will dip into and out of, rather than reading from cover to cover. It is a book that will delight and inspire you, especially when, for whatever reason, you cannot get out onto the mountains and it is a book that can be used to explain, if ever such an explanation is needed, why so many of us try to spend so much time rambling across our mountains. The RRP of the book is Euro 29.99. The book is available in most good book shops, Easons, Amazon and Collins. Gareth has signed copies for sale directly through his website: http://www.garethmccormack.com/mountains-of-ireland We recommend purchasing direct. 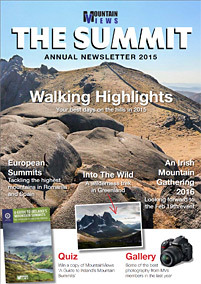 In February 2016 MountainViews was delighted to announce something new, our first ANNUAL, an online magazine for Hillwalkers in Ireland. Now we are looking for articles and reflectons on where you walked for 2016 for the next issue, due out Feb 2017.
and these shared tracks Brassel Mountain, MacGillycuddy's Reeks Ireland, Caha Mountains Ireland, Caha Mountains Ireland, Camaderry South East Top, Dublin/Wicklow Ireland, Corcóg, Maamturks Ireland, Dublin/Wicklow Ireland, Dublin/Wicklow Ireland, Knockanoughanish, Caha Mountains Ireland, Knockatee, Caha Mountains Ireland, Knockchree, Mourne Mountains Ireland, Knocknafallia, Knockmealdown Mountains Ireland, Maulin, Dublin/Wicklow Ireland, Maumtrasna, Partry/Joyce Country Ireland, Mothaillín, Dunkerron Mountains Ireland, Pigeon Rock Mountain, Mourne Mountains Ireland, Robber's Pass Hill, Dublin/Wicklow Ireland, Seefin, Mizen/Sheeps Head Ireland, Slieve Donard, Mourne Mountains Ireland, Slieve Donard, Mourne Mountains Ireland, Slieve Muck, Mourne Mountains Ireland, Wee Binnian, Mourne Mountains Ireland tracks were created. Thanks to all 1262 who have ever contributed summits or routes info and forums. Summary. MountainViews now has 8114 comments about 1476 different hills & mountains out of the total in our current full list (1500). We want to get a good gps track showing each of the major ways up every summit in Ireland. If you see an option to add a "Short Summary" then do please consider creating one since another objective is to have a short summary for every summit in Ireland. There's a few (24) opportunities for you to be the first to comment on a summit. We also have around 1500 shared GPS tracks, mostly in Ireland. Apart from a few popular areas, there is a need for more routes in many different areas. Plain shared tracks without descriptions are welcome however if you have time then do please add route descriptions with photos.